Karen Lynn a gardener and beekeeper wrote the article, “Make Room for Mushrooms” sharing the variety of mushrooms you can grow at home. Mushrooms can be grown indoors or outdoor. It is recommended that first time mushroom growers grow them outside in a raised garden bed. She shares four types or mushrooms that are easy to grow, provides steps for growing mushrooms, and talks about the benefits of mushrooms. Mushrooms are a hot topic now. They can immediately turn any humdrum meal into a culinary creation, and to top it all off, mushrooms are healthy! Amazingly, growing mushrooms at home is easy. You can grow your own by following a few simple steps. 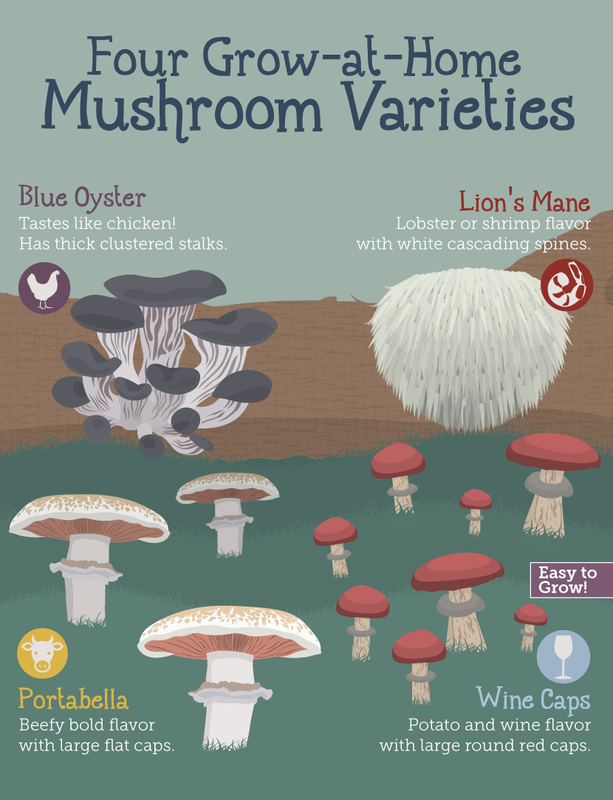 The variety of mushrooms you can grow at home is surprising, and you can grow a plethora of them, so you might actually have to figure out how to use them all up. Portabella mushrooms are the delicious, meaty mushrooms you can order at restaurants – when you sink your teeth into them, they almost taste like steak. Growing your own portabellas is easy! Blue Oyster mushrooms, which many say taste like chicken, are a favorite, as are Lion’s Mane mushrooms, which have a light, delicate, seafood-like taste similar to scallops. Some consider Lion’s Mane mushrooms to be a “Foolproof Fungus”. You can’t mistake their white fuzzy appearance. Last but not least on the list of easy mushrooms you can grow at home are Wine Caps, which are also a great beginner mushroom. Wine Caps are prized because you can grow them outside, and all you have to do is create a wood chip garden. This is their preferred growing medium. Gardeners who like to be out harvesting vegetables and working in flowerbeds prefer to start them outside. Wine Caps have a burgundy/reddish-brown wine color on their caps, which often fades to yellow. They have a unique potato and red wine flavor, which keeps mushroom lovers coming back for more! Growing mushrooms may initially seem expensive, but they will pay for themselves several times over. Growing mushrooms may initially seem expensive, but they will pay for themselves several times over. Some of the simpler box kits start at around $50, but these kits arrive completely set up so you can just open the box, place the mushrooms in a dark place, and water them from time to time. You can keep your costs down by creating your own DIY mushroom kit using one of several methods. This adds several steps to the process, but it will save you some cash in the long run, and you will still end up with your own delicious mushrooms. The three easiest ways to grow mushrooms inside without using an out-of-the-box kit involve plastic trash bags, a plastic container, or a laundry basket. You need a container of some sort that is extremely clean. You can use a bleach/water mixture to ensure that your container is clean. You will also need a mushroom-growing medium, which can be sterile compost, hay, peat moss, or even dried grass clippings. Several combinations are available that fit every budget. 1. Obtain a suitable growing container for your mushroom-growing project – usually a plastic trash bag, a plastic container, or a laundry basket. 2. Sterilize the growing area as much as possible. Some use a bleach/spray mixture. 4. Cut stems off store-bought mushrooms, and place the mushroom caps gill-side-down on a piece of clean wax paper. 5. Wait 24 hours for the caps to release their spores, which you will replant when you are done. You may cover the caps with cups if you like, which can keep the delicate spores from blowing away. 6. Place soil in a small container and gently transfer the mushroom spores you collected to the container. 7. Cover the top of the growing container with clear plastic wrap. Poke eight to twelve holes in the plastic wrap to allow additional airflow. Use the growing instructions below to grow your mushrooms. 8. Mushrooms like it humid, so using a spray bottle, mist the soil with water often. Ideally, keep the mushroom kit between 55 and 60 degrees Fahrenheit, but every mushroom variety is a little different. In 10 to 15 days, you should be harvesting your own mushrooms!